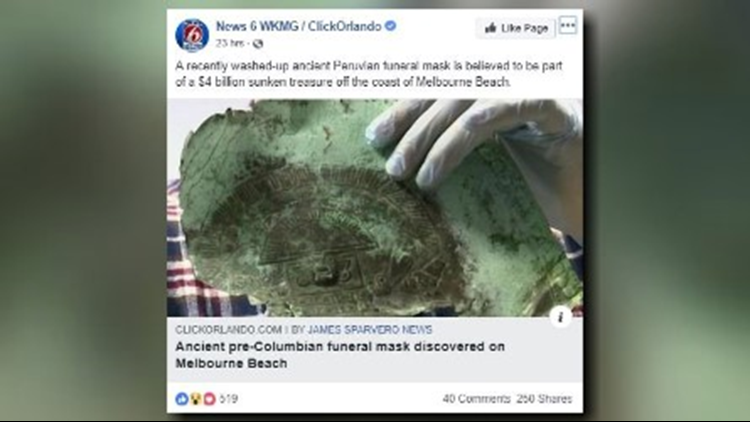 A Peruvian funeral mask, believed to be part of a $4 billion sunken treasure off the coast of Melbourne Beach, recently washed ashore, WKMG reported. MELBOURNE BEACH, Fla. — Explorers believe they’re getting closer to what could become the most lucrative archaeological discovery of all time. The station reported the explorers are at a confidential location at sea. The treasure went down with a Spanish ship that sunk in 1715 during a hurricane as it sailed from Cuba to Spain, according to researchers with the Seafarer Exploration Corporation. Army Ranger and MIT adjunct professor Dr. Mike Torres told WKMG teams have found the debris trail after searching for the past 11 years.